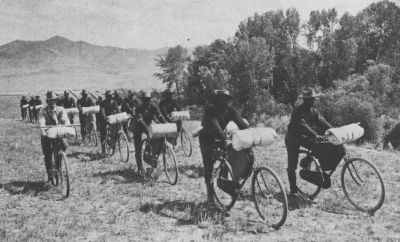 The 25th Infantry Bicycle Corps was a unit of black soldiers commanded by a white officer, Lt. James A. Moss, which was formed in 1896 to test the combat viability of bicycle-mounted troops by riding from Missoula, Montana to Saint Louis, Missouri. Moss, a West Point graduate and avid cyclist who held his black enlisted men in high regard, wrote Major General Nelson Miles about his interest in the use of the bicycle in warfare. General Miles, himself keen on the bicycle’s military potential, placed Moss in command of a special unit intended to test the bicycle. This would be accomplished first by a ride from Fort Missoula, Montana to Yellowstone National Park and back in 1896 and then with a ride from the fort through the Rocky Mountains, and across the Great Plains to Saint Louis in 1897. The unit consisted of Lt. Moss, twenty black enlisted men, including 1st Sgt. Mingo Sanders, and a white medic. To help document the trip, the riders brought along reporter Edward Boos. The bicycles were supplied by the Spalding Bicycle Company of Springfield, Massachusetts. The Bicycle Corps departed from Ft. Missoula, cheered on by an enthusiastic crowd of townspeople, on June 14, 1897. They immediately faced hardships crossing over the continental divide where muddy roads and fresh snow stalled their progress. After leaving the mountains the riders’ route followed the Missouri River into the Gallatin Valley. They rode through the main street of Bozeman, Montana attracting much attention and interest. From there, they crossed the Bridger Mountains and continued along the Yellowstone River to Billings, Montana and then to the site of the Battle of Little Big Horn and into Wyoming. There, inclement weather almost spelled disaster for the Corps as exhaustion and low visibility led to the riders becoming lost, only barely arriving in Moorcroft, Wyoming. From Moorcroft they traveled southeast to Nebraska where extreme heat and a water shortage caused more hardship, as the only available water sources were contaminated with alkali which made many of the men sick. As the riders crossed into Missouri the riding conditions improved, but the locals became more hostile, even refusing to allow the soldiers to camp on their farms, arguing that they were in the Union Army. In Missouri, Pvt. Eugene Jones left the Corps and returned to Montana. When the Corps reached the Mississippi River, they were met by the Saint Louis Wheelmen, a local bicycle club, and escorted into the city on July 24. While the Corps’ arrival was greeted with much local excitement, military interest had waned. Moss’s proposal that the riders continue on to Saint Paul, Minnesota was denied. The bicycles were returned to the Spalding Company, and the soldiers returned to Montana by rail. Soon afterwards the 25th Infantry was deployed to Cuba in the Spanish-American War. George Sorenson, Iron Riders: Story of the 1890s Fort Missoula Buffalo Soldier Bicycle Corps (Missoula: Pictorial Histories Publication Company, 1996); The Bicycle Corp: America’s Black Army on Wheels, written and produced by Gus Chambers (PBS Home Video, 2000). written and produced by Gus Chambers (PBS Home Video, 2000).